2 Kings 2 opens an indefinite time after the last recorded act of Elijah. Ahaziah, king of Israel, increased his great wickedness by inquiring of the false god Baal-zebub whether he would recover from his grievous injuries. The Lord sends Elijah to pronounce judgment on Ahaziah (2 Kings 1:3), and Elijah also calls down fire upon those who presumed to order him about (2 Kings 1:9-12). Ahaziah died, just as the Lord had said, and Jehoram reigned in his place, somewhere around the year 852 B.C. However, though we are not told when Elijah’s translation occurred, it was not, at least, a surprise to anyone involved. The chapter opens with the words: “Now when the Lord was about to take Elijah up to heaven by a whirlwind” (2 Kings 2:1). This is not merely literary anticipation, because Elijah knows he will be taken (2 Kings 2:9). The sons of the prophets whom they meet all know it (2 Kings 2:3, 5). Elisha himself also knows it. Elijah doubtless had received this revelation from the Lord, just as he is also told where the Spirit wants him to go (2 Kings 2:2, 4, 6). Nevertheless, it is a sober occasion. 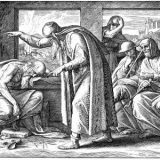 Elijah tries to persuade Elisha to stay behind, but Elisha refuses out of a faithfulness to his master (compare Ruth 1:16-18). The sons of the prophets ask Elisha if he is aware of the coming event, and Elisha responds not in anger, but in the spirit of one who is troubled. In the face of the Lord performing such a magnificent act, it is appropriate to be silent in holy fear (Zechariah 2:13; Habakkuk 2:20; Zephaniah 1:7). A few items of note before turning to Elijah’s translation. First, they begin their journey in Gilgal, which, if it is the same as the one in Joshua 5:9, is where Israel demonstrated a renewed faithfulness upon entering Canaan. More certain, however, is that Elijah and Elisha pass through two wicked places: Bethel is the site of one of the golden calves of Jeroboam (1 Kings 12:28-29); and Jericho has been rebuilt in spite of the promised divine judgment (Joshua 6:26; 1 Kings 16:34). Yet in the midst of these cities are the faithful sons of the prophets, those who are yet faithful to the living God. Just as the Lord had said to Elijah, He has preserved for Himself those who have not bowed the knee to idols (1 Kings 19:18). Further, when Elijah strikes the water and passes over the Jordan, he does so heading to the east. Israel under Joshua had crossed the Jordan on dry ground, just like Elijah does now, but heading westward into Canaan (Joshua 3:14-17). Because Israel passed over “opposite Jericho,” Elijah is effectively retracing this path in reverse. This is also the land where Moses had been secretly buried (Deuteronomy 34:5-6). Elijah asks Elisha when they were on the eastern side of the Jordan what he would have him do before he is taken. Before, not after he is taken, because the time for asking for spiritual things from fellow believers is while they are still in the flesh. Once Elijah is taken away, he can no longer do anything for Elisha; the only one in heaven who can is the Lord God (Isaiah 63:16; Matthew 6:7-8; Revelation 6:9-10). The Lord takes Elijah up in a fairly public display of power. The first man to be so translated, Enoch, could not be found (Genesis 5:24). Christ in His own ascension had more witnesses (Acts 1:9). But in every case, the ascension is meant to be a comfort and a sign. A comfort, because God is faithful in His promises, and those who walk with Him will receive His gifts. Yet also a sign and a testimony of the coming of the Holy Spirit, to Elisha who saw Elijah taken and to the disciples who heard Jesus promise the coming Pentecost. In the case of Elisha, he received the promised Holy Spirit and reentered Canaan, crossing again just as Elijah had done (2 Kings 2:13-15). In the case of the disciples, the Father sent the promised Holy Spirit not many days later (Acts 2). As a final note, Elisha cries out “My father, my father! The chariots of Israel and its horsemen!” While it seems natural to assign this somewhat enigmatic phrase to the event itself, Joash the king of Israel will later use the exact same phrase at the death of Elisha (2 Kings 13:14). 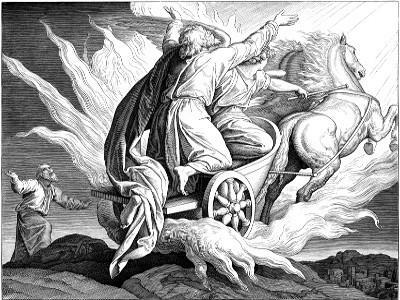 The chariots of Israel and its horsemen therefore refers to Elijah. It is perhaps best understood as an expression of grief from being separated from his master, which would also explain why he rips his clothes. Israel’s “strength,” so to speak, is being taken away, yet Elisha will see that the Lord who takes away is also the Lord who gives. As for the chariots themselves, the Lord can certainly do as He pleases. 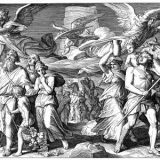 But Elisha will later show his servant the chariots of fire which surround the city (2 Kings 6:17), and Psalm 68:17 states that “the chariots of God are twice ten thousand.” It is possible, but only possible, that these fiery chariots are angels (consider also Luke 16:22).